A new study estimates that the value of international and domestic trade in counterfeit and pirated goods in 2013 was $923bn to $1.13tn, forecast to reach $1.9tn to $2.81tn by 2022. 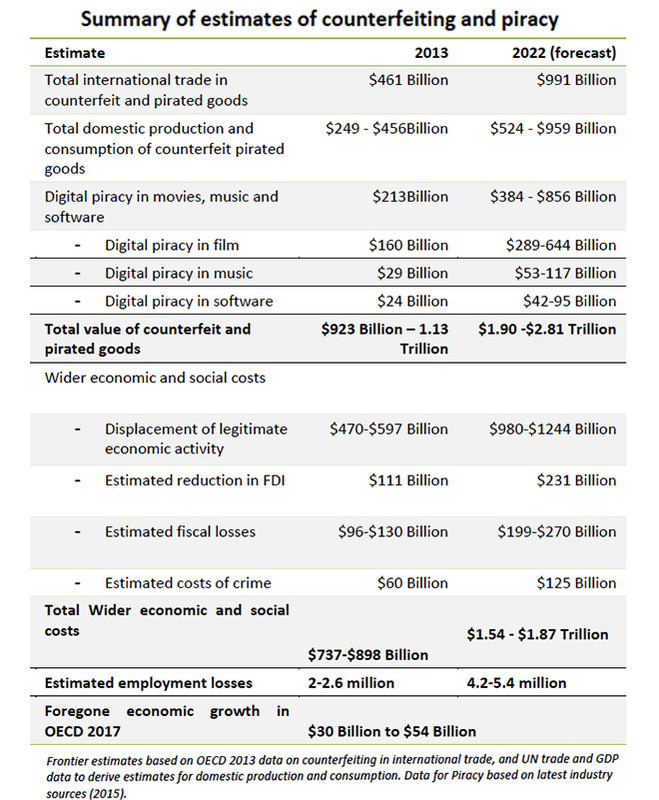 The global value of digital piracy in movies, music and software in 2015 accounted for $213bn, a figure that could reach between $384bn and $856bn by 2022 (depending on assumptions). The report commissioned by Frontier Economics, The Economic Impacts of Counterfeiting and Piracy, attempts to quantify the global impacts of piracy across the range of sectors most damaged by this practice in the 35 members of the Organization for Economic Cooperation and Development (OECD). Piracy and counterfeiting have significant effects on the job market through the displacement of legitimate economic activity. The study estimates net job losses in 2013 to lie, globally, between 2 million and 2.6 million, and it projects net job losses of 4.2 million to 5.4 million by 2022. Amongst a wide range of sectors, the study examines on three industries – film, music, and software – where digital piracy has a particularly significant impact, and these sectors account for the bulk of digital piracy. In this article we concentrate here on that section of the report that focuses on film piracy. “The general industry evidence appears consistent with a hypothesis that piracy has hurt the movie industry.” This statement, taken from a research by Jay Liebowitz, is based on the fact that the introduction of BitTorrent in 2003-04 has coincided with a turning point in the development of film industry revenues. Revenues for sales and rentals of pre-recorded movies in the U.S. declined by more than 20% between 2005 and 2010 after having increased steadily until then. The Frontier Economics reports points out that perhaps the best empirical proof of a negative relationship between piracy and legal sales was the shutdown of Megaupload, a major cyberlocker and filesharing site, in 2012. Analysts noted an increase of between 6.5% to 8.5% in revenues of three large film studios in the first 18 weeks following the closure of Megaupload. This shows that some consumers turn to legal methods of movie acquisition when a major file-sharing site has shut down and by extension that online movie piracy displaces digital movie sales. While the authors admit the difficulty to quantify and the need to make assumptions, they reached the conclusion that the commercial value of digital piracy in film in 2015 was $160bn. By 2022, this figure could spread between $289bn and $644bn. 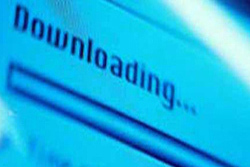 The first number assumes that digital piracy will maintain its share of total counterfeiting and piracy over time. The second number assumes that digital piracy grows proportionally to global IP traffic. P2P is the most popular method of illicit movie acquisition and BitTorrent is by far the largest P2P network, accounting for 39% of total pirating activity is done on BitTorrent, (according to a NetNames study). Scaling up this figure, the report arrives at 47.8 billion illegal movie downloads in 2015 across all forms of digital movie piracy. Full report can be obtained here.